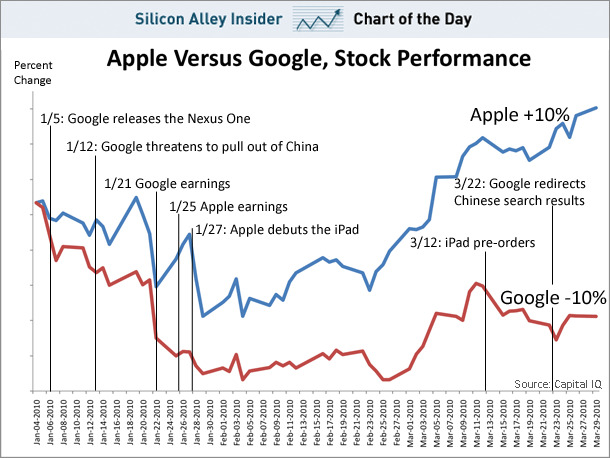 Who’s winning the increasingly tense battle between Apple and Google? From an investor’s perspective, so far this year, it’s Apple. By a long shot. 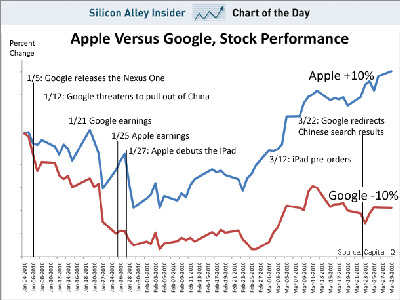 Year to date, Apple’s stock is up 10%, while Google’s is down 10%. Investors are excited by Apple’s iPad, as well as the possibility of an iPhone on Verizon in the near future. Meanwhile, investors are cooler on Google after the company pulled out of China, and its Nexus One failed to deliver. Here are some Apple and Google milestones so far this year.